Time to play: 20-30 minutes per player. This is a review of a prototype copy kindly sent to us by Rattlebox Games. Mike: In Cromlech 2-4 players fight for their faction’s glory as druids. The druids build stone circles (Cromlech’s) and use elemental powers to defend these circles and attack the other druids. The game is played over 3 rounds (years) that comprise of 4 turns (seasons). At the end of these 12 turns the player who has done the most damage to their opponent wins. 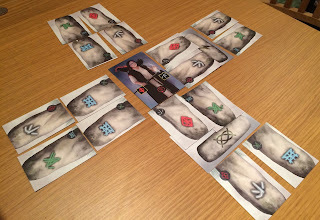 In year one you build up the inner ring of stones using a drafting mechanic. Players take it in turns to choose from a selection of 2 stones in the middle of the table. This continues until there is a circle created like the one in the picture below. 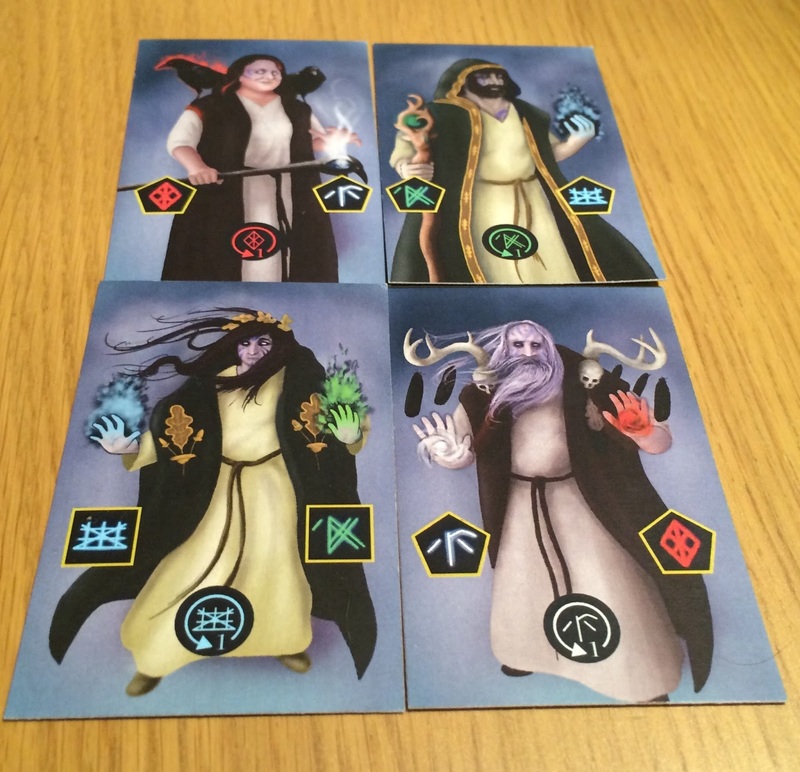 You then select a druid from a choice of four. Each druid specialises in one element (Fire,Air,Earth,Water). It is important you choose a druid that complements the strategy you wish to play. David: Well the first thing that caught my eye was the theme. I like games that have a medieval theme. The game is a dice building game and has quite a bit of strategy. In the beginning I was rolling earth and fire which give you a higher chance of attack. I should have been rolling water and air which will give defensive bonuses for later on in the game. Mike: Yeah duelling druids is a new one for me I don’t think we have a game like this in our collection. I wouldn’t put this in the class of an entry level game there is quite a bit to learn and it took us a few games to get comfortable with the rules. For example you have to take into account what druid your opponent has when attacking as you can only damage an opposing element. Fire and Air oppose earth and water. So a fire attack will not hurt a Fire/Air druid. Also when you are attacking your opponent’s stones there is a table of what elements you need to combine. This does mean it might be a bit tricky for younger players to pick up. I guess it largely depends on their gaming experience. David: The re rolling and attacking using dice reminds me of King of Tokyo. With the lintels giving you additional dice powers like the power ups you can buy in the game. It’s more strategic than King of Tokyo though and feels a bit like Dice Masters in the way you have to pick your dice to play with. I really enjoyed our games and would like to play a few more times to improve my strategy. I can’t wait to see what the final game looks like. Mike: It certainly plays well we had some very close games. Something that shows the mark of a well-balanced game. I really like the Celtic theme and the fine balance of luck and strategy. It has been a pleasure to play and we can’t wait to see how the final product will turn out. 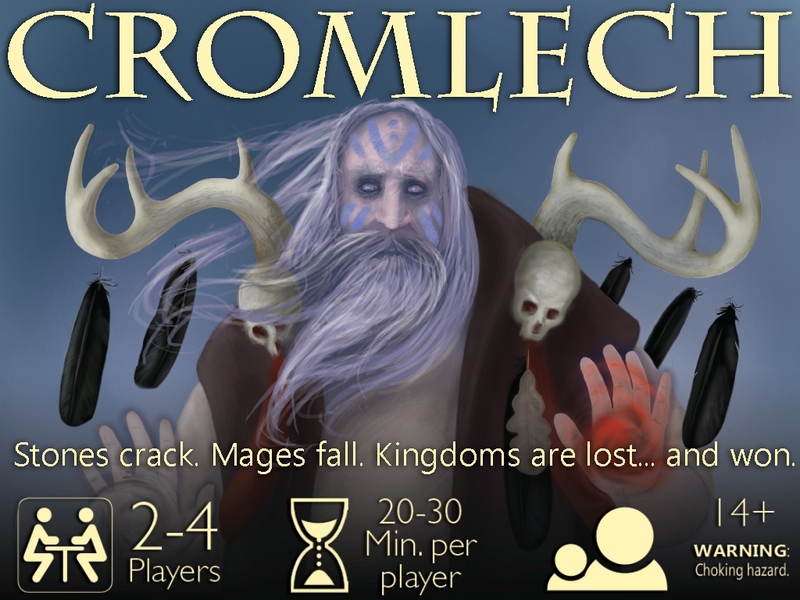 As we write this Cromlech still has just under a week left on its Kickstarter Campaign. We wish it well and hope it funds as it’s a great game with a lot of depth. Da Iawn Rattlebox. Keep up the good work. 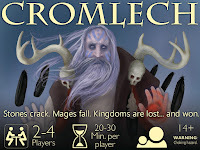 Also to see it in action check out this play through by Rattlebox games. Yes - I need to do a Board Game Bar soon haven't been for ages.